Branch Connectors are used to connect a Branch with a Run pipe. Due to this reason their dimensions are indicated showing the inches of the branch and of the Run Pipe. Dimensions of these components have to be calculated in order for them to act as a reinforcement to the thickness of pipes to be connected. Calculations of Branch connectors have to be done in accordance to ASME B31.3. 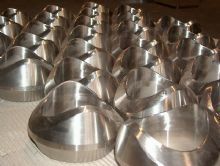 We are not "hot forming" pieces by stamping them but we are tool machining a forged pieces to get to final dimensions. This process can be competitive only for special pieces (materials, dimensions or limited quantities) when a production scale can't be justified.